You’ve probably wondered from time to time just who is doing what in the chapter. This is a list of the members of the board of directors, with a one-liner description of what their job is. Don’t know who all these folks are? Maybe we can collect head-shot photos to help! Officers of the chapter are spelled out in our by-laws. All of the officers except the Historian are elected annually by the membership. The Historian is appointed by the President, as specified in the by-laws. 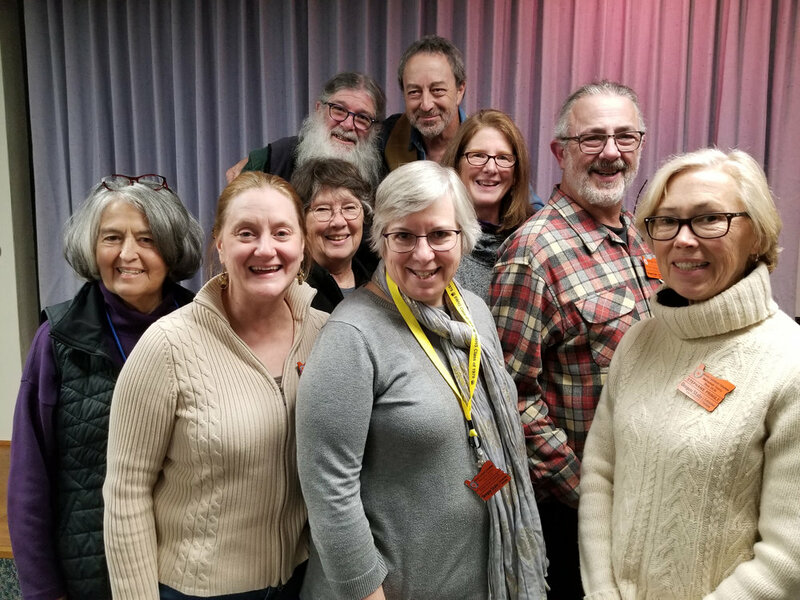 The Oregon Master Gardener Association reps serve a two-year term and shall be responsible for maintaining communication between the Chapter and Oregon Master Gardeners Association by attending OMGA quarterly meetings. One Oregon Master Gardener Association Representative shall be elected each year to serve a two-year term. Only the most senior representative present may vote. The Past President usually serves a one-year term and provide advice and assistance to the Chapter President. Committee Chairs (more specifically, Standing Committee Chairs) are appointed by the President and serve on the board, as specified in our by-laws. I think John has been leading this group forever. The Awards committee accepts nominations for Chapter awards and annually selects MGs to recognize outstanding service and dedication. It also handles applications for scholarships to mini-college each year. This committee has created and implemented activities to cultivate a strong, vibrant, connected Master Gardener Community. Harvest Fest and Plant Swaps are examples. Would you like to help create more? Heidi and Nancy continue to lead this committee. The Demo Garden Committee plans and oversees workdays at the Demo Garden and the Annex, keeps a record of activities in the Garden and shares the information with individuals who have expressed an interest in the Demo Garden. This the the second year Rich has lead the IE Sale. He has been actively involved since its earliest days. The committee coordinates the many volunteer committee activities required to support the Incredible Edibles plant sale – the biggest source of revenue for the Multnomah County Master Gardener chapter. Carolyn continues to lead this committee. They provide welcoming and refreshments for our Chapter meetings and some other activities. The depend on volunteers to sign up to bring food at meetings. Heidi continues to lead this taxing job. The Membership Committee accepts membership renewals, placing the data in a spreadsheet so that it can be sorted as needed for other Chapter committees. The committee provides a roster of all members to the Directory committee for inclusion in the Chapter directory. Sally and Marcia continue leading this group. The committee identifies, contacts, and recruits potential speakers for our chapter meetings. Once dates are agreed upon, they solicit a description of their presentation, a short biography, and a photograph and ensure that information about each speaker is disseminated via the directory, newsletters, press releases or other outlets. Jack and Rich continue in this role. The liaison attends meetings with the Program Staff to communicate Chapter concerns to the staff, and bring program news back to the chapter. It also offers input for the Chapter on future Metro program planning. The Communications Committee is charged with advising and assisting the chapter on all the official ways we communicate: both among ourselves and with the general public. Members draw on their rich individual experience and collaborate to define communication strategy and improve existing communications efforts. The committee is always looking for new members to lend a hand with jobs large and small! If you would like to be a part of the committee, please email Dave Owen. Lorna continues as editor. The Grapevine is a short monthly newsletter intended for viewing mostly by MGs in the other Metro chapters. A link to it is provided in the monthly Metro Master Gardener Newsletter published by the program office. The eNews is published at the beginning of each month, and is intended to be the chapters voice to our own members. You can contact the eNews editor here.